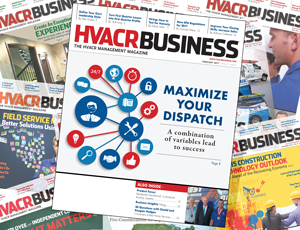 The January issue, with it's mix of business management content and pre-show AHR Expo coverage sets the tone for the year to come. Sometimes, it can be difficult to follow that up for February. I say sometimes, but we always find a way. As usual, final production of the February issue coincides with last minute AHR Expo preparations, which only adds to the hectic nature of the office in January. Thanks to our friends at Nexstar, however, deciding on a cover story wasn't difficult. Tom Merriott, a Nexstar business coach, wrote an excellent piece on how to mazimize your dispatch to ensure a smooth operation. It's information that is useful to contractors of all sizes, and should help alleviate any growing pains you have when scheduling your technicians. In addition, Howard Weiss from HVAC Excellence outlined some of the new EPA regulations for 2017 — something of which all contractors should be aware. At this time of year, many contractors find themselves in sort of a lull as they try to make this period between winter and summer more profitable. Ruth King tackles this problem in her column by outlining some ways to make your first quarter profitable. It's been unseasonably warm up here in Cleveland this winter. Regardless, there's still a good chance it could get cold and snow at any time — so of course Terry is down in Florida. But it's not all sunshine and golf for him ... he's there to work. One day, he drove to Naples, Fla. to visit Chadd and Keegan Hodges at Best Home Services for his 20 Questions column. While he was there, the two brothers were visited by Florida Governer Rick Scott, who presented them with the Business Ambassador Award in recognition of their growth from 10 to 145 employees. Best Home Services has a great story, so it made for a facinating interview. Those are just a few of the features from this issue. If you haven't had a chance to read it yet, I encourage you to check it out soon.